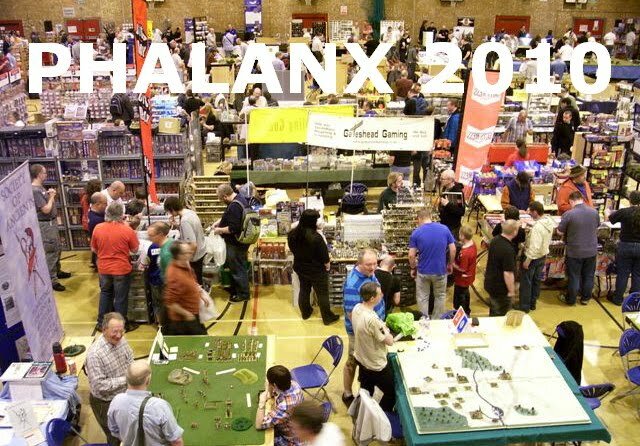 Thanks to the warm hospitality of Steve Ayers and the Gentlemen Pensioners, Phalanx is as much a weekend event as a wargames show - a combined effort between Lance & Longbow, ourselves and the Pike & Shot Society, followed by a big old-fashioned wargame on the Sunday. The justification, of course, is the St Helens show, warm, welcoming and friendly. Following an established tradition, the Society attraction here is Martin Charlesworth and the Crosby crew's DBA participation table - and an annual opportunity to catch up with Martin, former Society Officers Jim McDowall and Phil Halewood, and Tony 'Gildas' Hughes who did so much work for the Society on printing and production in years past. It's always great to see everyone. With Martin and co, energetically manning the game, I got a chance to wander round the show, have a chat with Martin Stephenson about the new 15mm Italian figure releases, show Stephen Oates the painted up results of the 10mm samples he passed me at Triples - and generally browse the new and old attractions of the show. Some good and inspiring stuff. Good to see the East Lancs group using their own rules rather than feeling obliged to follow one flock or another. 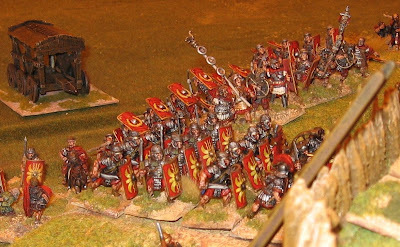 Even though it's a standard style these days, and given I'm not that keen on decals for shield designs, I thought the Romans from the hill fort game were particularly photogenic. Of course, my weekend would not have been complete without the big game on Sunday. This year, as a result of some last minute force majeur, we were back in the Sudan. 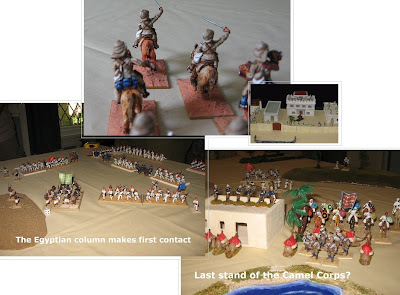 Even though this is a blog about Society of Ancients show outings, I'm sure you will want to see a collage from the Nile. Sword and Flame rules. Old School 25/28 figure mix. Simple presentation combined with good company. Much though it pains me, as a British Lancer officer, to admit it, the Dervishes just about shaded it. 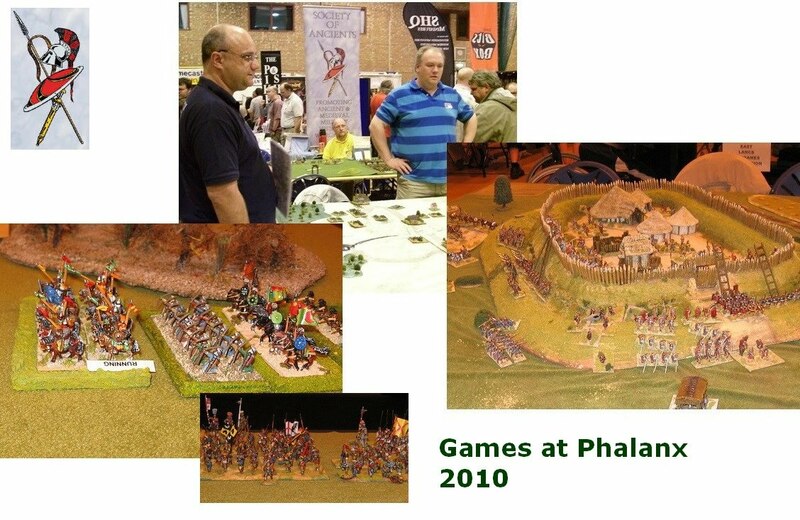 The first weekend in June sees us at the UK Games Expo, just up the road for middle Englanders like the Shows North team, in Birmingham. Excellent location ... quick to get in to. This year the parking seemed better organised, and not a problem. Everyone very helpful as always.For entertainment, we had with us the latest edition of our Anno Domino participation game 'Greyhounds in the Slips' (not the compressed version taken to Partizan) ... very much there, but I think we need more height, more junk and more 'breach'. We were located as normal next to the Bring & Buy ... and once the overwhelming Saturday 'book in' crush had dissipated (but that's half the first morning, sadly), the game ran intermittently throughout the weekend. 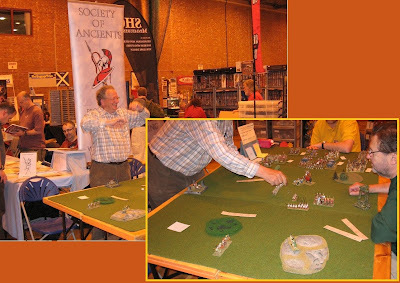 Henry got himself killed a couple of times, and killed the French by shooting at them once - but by and large, stormed the breach, setting about the old enemy and carried the position.As usual, it was great to meet so many diverse games enthusiasts, explain what the Society of Ancients does, give out sample copies of Slingshot etc. Members should also feel proud of the wide range of imaginative and inexpensive games the Society has built up over the years. 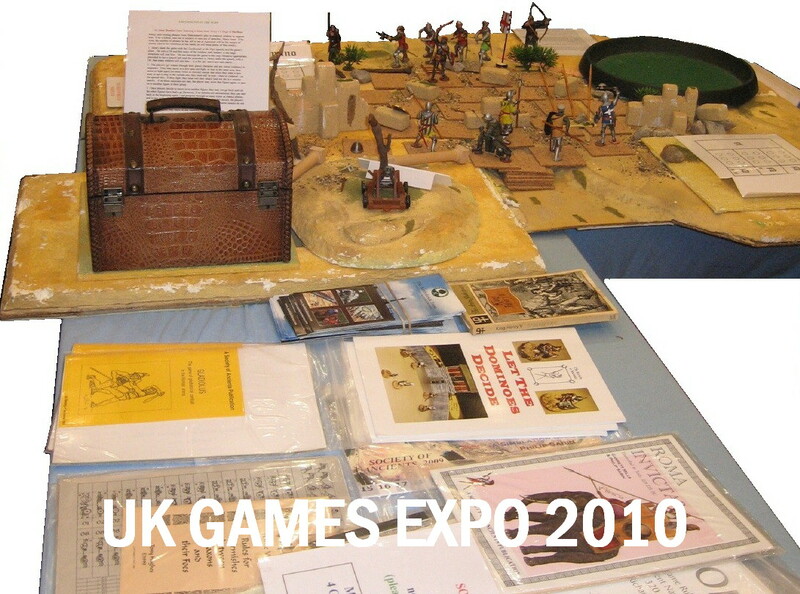 They are very popular amongst visitors to the Expo, and over the years, it has been very satisfying to watch the collection grow from its beginnings with Andy Gittins's Gladiolus into an entire table full of options from quick fire two player games to full multi-player campaigns, boardgames and innovative card games and matrix games. 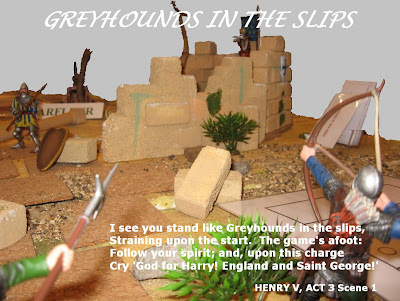 Taking a cue from Act III of Shakespeare's Henry V, of course, Greyhound in the Slips is built around Graham Hockley's simple Anno Domino combat formula, the original version of which can be found at the back of the Society of Ancients booklet 'Let the Dominoes Decide'. 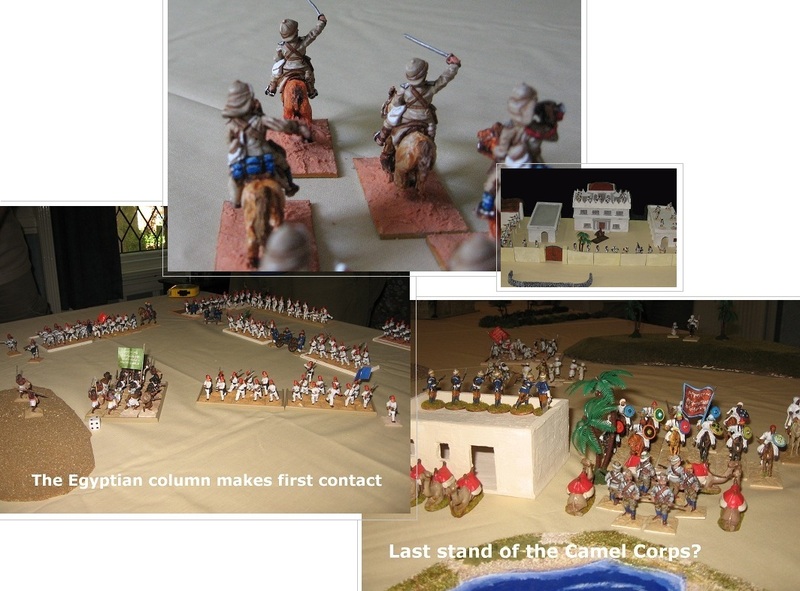 Also based on Anno Domino, Ad Hoc's participatio game Six of the Best won Best Participation Game at Salute. 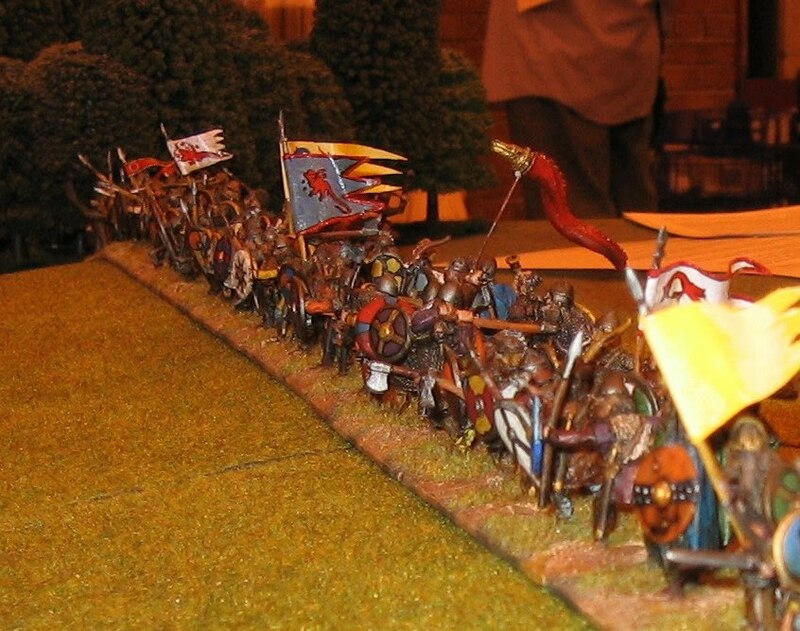 And as well as the various card game tournaments and demonstration games, there are also some wargames competitions, a 'one day' Field of Glory event on the Saturday, and Flaming WW2 on the Sunday. None too taxing by all accounts, and well done. 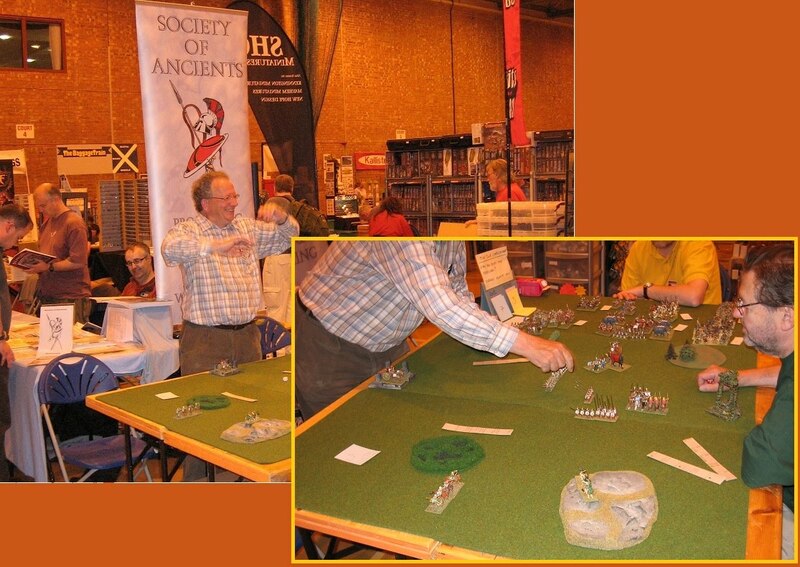 I popped in to see the ancients event - a mixture of familiar faces and newcomers which is good to see. 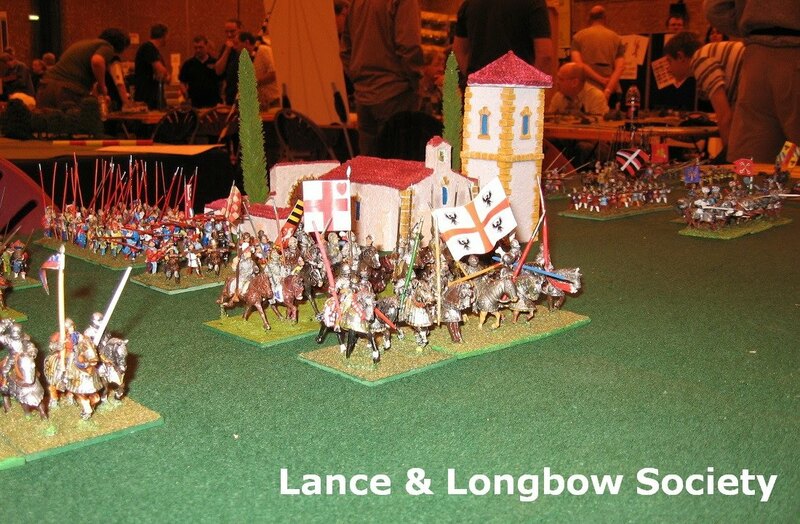 By special request, we also put on a few try out games of Gladiolus on the Sunday ... both my 15mm version and Will's 20mm plastics. So two different games in three different scales, all told. Well worth a visit, watch out for the UK Games Expo ... after a short break, they will start the build up for the 2011 event soon - and, for diversity, it is something enthusiasts should consider amongst all the other great shows that will be coming up over the next 12 months. 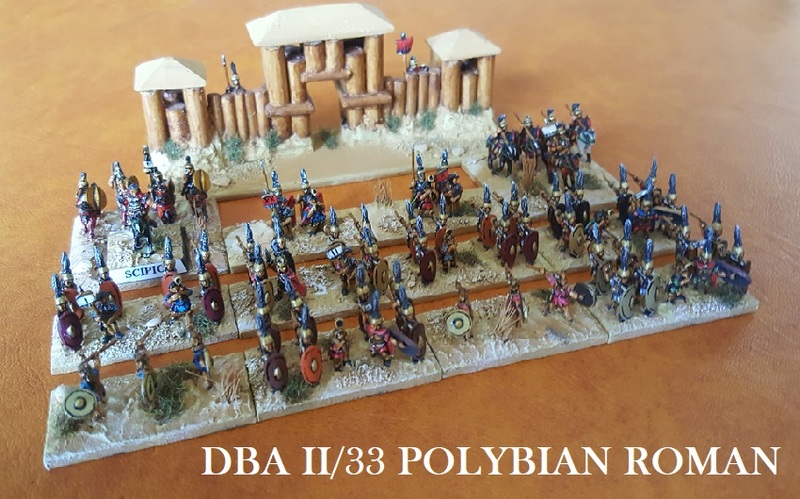 Of course you don't have to wait that long to see the SoA again ... we'll be at Phalanx in two week's time - all the usual gear in support of Martin Charlesworth's ever-popular DBA participation challenge.